Can big brands learn from Uber, Kickstarter, Airbnb and the Maker Movement? Yes, they can. They’re using the same strategies as those startups to connect to their markets and they are doing it at a rapid pace. 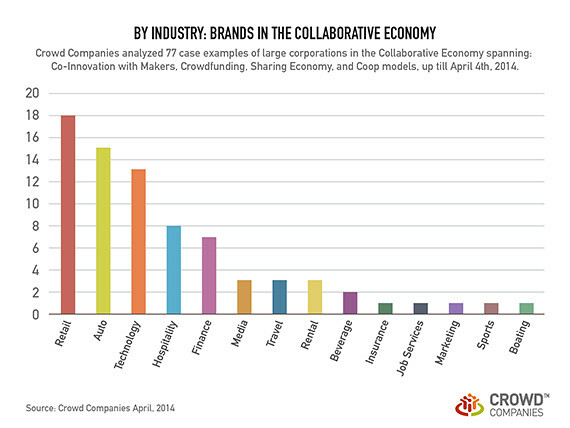 The Collaborative Economy is a movement. People are empowered to fund and build their own bespoke goods in the Maker Movement, and people are using new technologies to share what they already have in the Sharing Economy. In both cases, people are empowered to get what they need from each other – rather than buying through traditional channels. As new business models are emerging, corporations aren’t standing by idly. They’re adapting and changing quickly. (You may access this detailed timeline.) While we’ve yet to see return on investment numbers from any of these early deployments, our research of this same sample set indicates that the frequency of brands deploying has been increasing, even before the launch of Crowd Companies six months ago. Chart 1, above: Across the nearly 77 case examples up until April 2014, the greatest number of the deployments were from the retail industry, followed by the auto industry, then the technology space, then hospitality. In some cases we included consumer product goods and durable goods which impact the retail space in the frequency count. Key findings: Companies closely related to consumer-type business models are most impacted and, therefore, have done the most deployments. 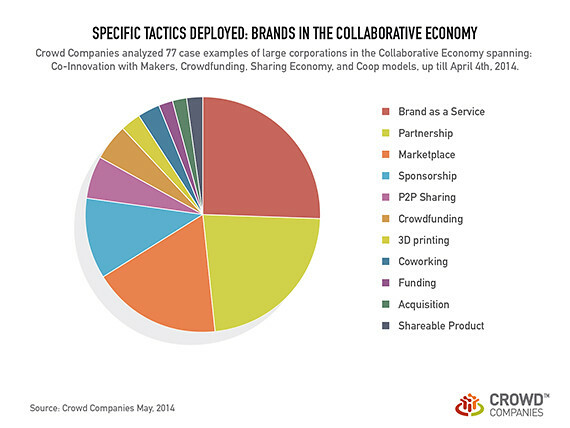 Chart 2, above: Across the broad spectrum of the collaborative economy (e.g., maker movement, crowd funding, sharing economy) corporations are employing tactics that are related to the sharing economy. The one isolated instance of a co-op, where the company is owned by the customers and employees, is REI. The second most common strategy was tapping the Maker Movement, often in the form of co-innovation, also known as outside-in innovation or other variations of that phraseology. Key findings: Corporations gravitated towards sharing economy business models, often through sponsorships and partnerships with leading players like Uber, but this doesn’t guarantee business model resiliency beyond the media pickup. Chart 3, above: This chart is a subset of the preceding “Strategy” breakdown, shown directly above. We found that most companies are employing “brands as a service” tactics, which means products are sent on-demand or are available as rental business models, instead of through ownership models. In particular, BMW, Peugeot and Daimler rent cars directly to drivers, and hotels like Westin and Cosmo rent workout gear and dresses on Rent The Runway, respectively. Key findings: Brands deployed “Brand as a service” which often equates to a rental model, or on-demand model, to meet new market demands of “access over ownership.” Much of this was achieved through partnerships with players like Uber or other on-demand entities. A few companies have launched their own marketplaces or partnered with other companies that offered similar services. Large corporations continue to adopt disruptive technologies. Twenty years ago they adopted the internet. Ten years ago they adopted social media. 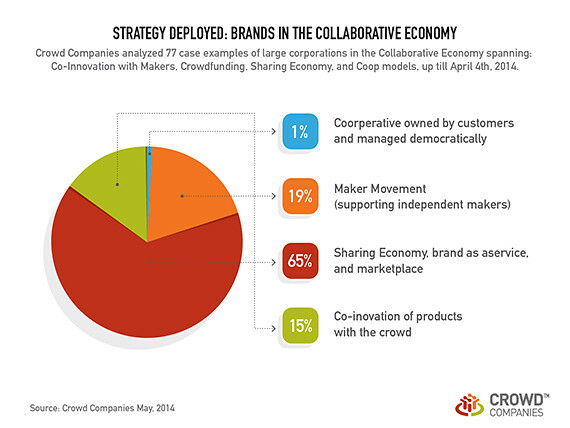 Now, in 2014, they’re adopting the methods of the Collaborative Economy. The internet phase required an online B2C model. Social media shifted to peer-to-peer communication. In this next phase, brands must offer their own peer-with-peer-to-commerce models. In each of these phases, business model shifts and mindset changes were required, letting go of some control in order to gain more business. To learn more, find my body of work on the collaborative economy which includes research, frameworks, graphics, data, and case examples.